Did you know that 20% of everything we make is customised? We can also help you! Arthrodesis Coxit Seat CY (W:47xD:50 cm). Large arthrodesis seat with greater width and depth. The seat has adjustable panels at the front, which can be adjusted steplessly and independently of each other. It is suitable for people with stiff joints, amputated legs or those who have had hip operations and where an open hip angle for one or both legs is required. Arthrodesis Coxit seat Y (W:44xD:45 cm). A standard size seat with adjustable panels at the front which can be adjusted steplessly and independently of each other. It is suitable for people with stiff joints, amputated legs or those who have had hip operations and where an open hip angle for one or both legs is required. CY seat (W:47xD:49 cm). Ergonomically shaped, padded seat with rounded front edge. This is a comfortable seat which makes it possible to achieve an active sitting posture with support and comfort for the user without the seat cutting off the blood flow to the legs. Y seat (W:44xD:44 cm) with removable seat cushion and cover. The seat cushion can be easily replaced without the need for tools. ES5 backrest, (W:43xH:46 cm) (Distance between side guides: 28 cm). Has a padded back cushion with integrated side guides, which are especially suitable for children. The back cushion has soft, supportive side supports, which control the child at the waist. The height, depth and angle of the back cushion can be adjusted so the child gets as much support as possible in the sitting position. It is possible to fit a head support. The T3 backrest (W:38xH:50 cm) has a high, padded back with contours which follow and support the natural curves of the back. The angle of the backrest can be adjusted and locked, which makes it possible to achieve good lumbar support around the lowest part of the back and support for the shoulders. T3 backrest with lumbar pump (W:38xH:50 cm). The backrest has a high, padded back with contours and inflatable lumbar pump. The padded backrest follows and supports the natural curves of the back. The inflatable lumbar pump can be adjusted using one hand, while the user is sitting in the chair. The angle of the backrest can be adjusted and locked, which makes it possible to achieve good lumbar support around the lowest part of the back and support for the shoulders. Loose seat cover. The cover is breathable, hygienic and washable, and can easily be removed and washed in the washing machine. It is available in several colours and types of fabric. Loose cover for backrest. The cover is hygienic, washable and can easily be removed and washed in the washing machine. It is available in fabric or waterproof plastic. Loose seat cover in waterproof plastic. This cover is suitable for users who spill a lot at mealtimes and those who suffer from incontinence. The cover is breathable, hygienic and washable, and can easily be removed and washed in the washing machine. Ergon armrests (W:9xL:30 cm) with extra long armrest bar (41 cm) are useful for tall users who require good support from the armrests when getting into or out of the chair. They are also beneficial for users with a long upper body combined with short arms, e.g. users with dwarfism. Ergon armrest (W:9xL:30 cm). An adjustable armrest with armrest bar (31 cm). The height and lateral position of the armrests can be adjusted. The armrests are very strong, durable and stable, and are therefore suitable for users who require underarm support, e.g. at a desk, or support and relief when getting into and out of the chair. Fold-down armrest with pad (W:9xL:25 cm) and armrest bar 31 cm, for chairs with electric seat height adjustment. A flip switch is useful if you want visible buttons or want to choose the location of the switch yourself. The armrest with extra height is suitable for tall users who need good support from the armrests, for example, when getting up and sitting down, or for users with a long upper body and short arms, for example users with dwarfism. The armrest is easily folded down, e.g. for sideways transfer, or help with getting dressed. The height and lateral position of the armrests can be adjusted. The short armrest pad makes it possible for the user to get close to the table. Fold-down armrest with pad (W:9xL:25 cm) and armrest bar 18 cm, for chairs with electric seat height adjustment. The armrest is easily folded down, e.g. for sideways transfer, or help with getting dressed. The height and lateral position of the armrest can be adjusted to provide support and relief when the user moves to and from the chair. The short armrest pad makes it possible for the user to get close to the table. Fold-down armrest with pad (W:9xL:25 cm) and armrest bar 31 cm, for chairs with electric seat height adjustment. The armrest with extra height is suitable for tall users who need good support from the armrests, for example, when getting up and sitting down, or for users with a long upper body and short arms, for example users with dwarfism. The armrest is easily folded down, e.g. for sideways transfer, or help with getting dressed. The height and lateral position of the armrests can be adjusted. The short armrest pad makes it possible for the user to get close to the table. Fold-down armrest with pad (W:9xL:25 cm) and armrest bar 18 cm, for chairs with electric seat height adjustment. A flip switch is useful if you want visible buttons or want to choose the location of the switch yourself. The armrest is easily folded down, e.g. for sideways transfer, or help with getting dressed. The height and lateral position of the armrest can be adjusted to provide support and relief when the user moves to and from the chair. The short armrest pad makes it possible for the user to get close to the table. A 4-wheel brake frame is suitable for users who are very restless, or if the chair is standing on an uneven surface. The frame ensures optimal braking on all four wheels, even if the chair is on an uneven surface. The brake pedal can be used instead of a brake lever or together with a brake lever. The brake pedal is located on the back of the chair and is foot-operated. The pedal is an advantage if a standing person has to brake the chair without unnecessary bending or compromising postures. A brake pedal can be an advantage when using a push handle. An extension to the brake stick is an advantage for the user in a high sitting position or where the user has difficulties reaching a standard length brake stick. The T-brake lever extends the brake lever, making it easier for people with disabilities, e.g. in the shoulders, to reach the brake. Front castors (100 mm) with 3,1cm wide lanes are suitable when VELA Tango chair is used e.g. on a tile floor, floor with large joints or uneven floor. Due to the wide castors, the chair can run easier when you push the chair forwards or move around in the chair e.g. on narrow joints in the tile floor. E-footrest with 0-67 degree angle. The leg rests are swivelling with calf pads and fold-up footplate (37.5 cm), as well as adjustable length (32-48 cm). The leg rests can be angled and adjusted up to a horizontal position, which is useful if the user needs to rest the legs in a raised position, or if for example the user has hemiplegia but needs to walk the chair forwards while sitting in it. E-footrest with 67° fixed angle, which is side-hinged, swivelling and removable, with fold-up footplate (40 cm) and adjustable length (32-48 cm). When the leg rests are swivelled out to the sides, they can easily be removed. The footplates have a non-slip surface and can be adjusted at an angle. Fold-out foot bar which can be folded up so that it is not in the way when the user gets into and out of the chair. This foot bar is useful for achieving a good sitting posture and, at the same time, resting the feet when a high sitting position is required. S footrest with fold-out LP plastic plate. The S footrest is fitted to the seat, and travels with the seat when it is height-adjusted, giving the user good support for the feet. Head support with deep ES cushion, (W:25xH:12 cm), with soft, black Savanna leather. The height and angle of the head support can be adjusted, and it can be moved forwards and backwards, and easily removed without the need for tools. The head support can be fitted on the high backrests ES3 and T3 only, and is required when the tilt-in-space function of the chair is activated for resting. Head support with SW pad (W:26xH:13 cm), with black leather. The height and angle of the head support can be adjusted, and it can be moved forwards and backwards, and easily removed and fitted without the need for tools. The head support can be fitted on high backrests only, and is required when the tilt-in-space function of the chair is activated for resting. Pelvi lap belt, available in four sizes: XSmall, Small, Medium and Large. This belt is suitable for children as well as adults who require a very supportive lap belt. The Pelvi belt provides optimum support and reduces the risk of the user sliding forwards in the seat. Two-point lap belt with adjustable length and press lock (L:140 cm) or binding lock (L:115 or L95 cm) for users who require security, e.g. for outdoor driving at high speed. Can be washed in the washing machine. Table in acrylic with shallow lip. The table folds down and can be removed, and its height, depth and width adjusted to match the user’s sitting position. NB: The table rests on both armrests when fitted to the chair. Height and depth-adjustable push bar, which takes account of the carer’s work posture when having to transport a user in the chair over short distances. The height, depth and angle of the push bar can be easily adjusted to suit the person pushing the chair. Some users may also benefit from supporting themselves on a push bar when they walk around. The push bar is easy to remove. The Arthritis grip can make it easier to operate backrest angle and tilt if, for example, you have reduced strength or mobility in the hands and arms. The anti-tip bar provides the chair with extra stability, which is useful when the chair is used for cycling exercises or for users with violent movements. The bar is fitted behind the chair and ensures that the chair cannot tip over backwards. Lateral support with large, curved PU cushion (W:9xL:17 cm). This lateral support is suitable for users who require stability and support. The height, depth and width of the support can be adjusted. The lateral support can also swivel to the side to allow for transfer, and be fitted on various lateral support bars to fit the width of the body. These lateral supports can be used only in connection with high backrests. Available with different types of covers. The lateral support with padded cushion (W:17xL:10cm). This lateral support is suitable for users who require stability and support. The height, depth and width of the support can be adjusted. The lateral support can also swivel to the side to allow for transfer, and be fitted on various lateral support bars to fit the width of the body. These lateral supports can be used only on high backrests. Available with different types of covers. Lateral support with small, curved PU cushion (W:6xL:17 cm). This lateral support is suitable for users who require stability and support. The height, depth and width of the support can be adjusted. The lateral support can also swivel to the side to allow for transfer, and be fitted on various lateral support bars to fit the width of the body. These lateral supports can be used only on high backrests. Available with different types of covers. Main Line Plus is a popular quality fabric from Camira in 67% wool, 20% Flame Retardant Viscose and 13% Viscose. Abrasion Resistance 75,000 Martindale. It has a very good abrasion resistance, great comfort and is easy to clean. The following colours are standard colours. However, we can provide all the colours that you see on på the supplier's website. There may be an extra charge and longer delivery by selecting an other upholstery than standard. Clean with a vacuum cleaner, professional cleaning or wiping with a clean, damp cloth. We have our own upholstery, and therefore offers a lot of other types of fabric, which you can view here. There may be an extra charge and longer delivery by selecting a fabric other than standard. We want to make sure that you get the right VELA chair. So please find a dealer near you to get the right guidance. Have you seen our other variants of the same chair? VELA Tango 100 with arthrodesis seat is a customised chair with two-part, adjustable seat surface, which is designed for people with amputated legs or stiff hip joints. VELA Tango 200 is a customised chair with a larger seat and a higher backrest with extra lumbar support compared to the VELA Tango 100 model. 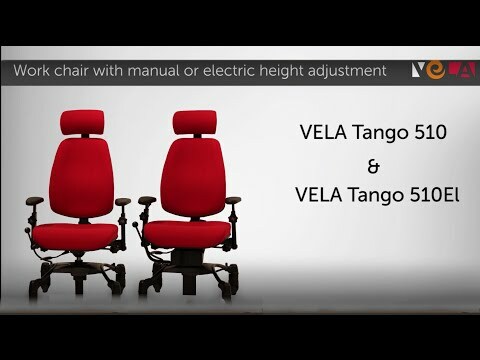 VELA Tango 200El is a customised chair with electric height adjustment and a higher backrest and extra lumbar support compared to the VELA Tango 100El model. Ashley was born with a condition leading to physical limitation. Getting a VELA Tango 100ES chair for school use gives Ashley a better sitting comfort and enables him to more involvement in school activities. All chairs from VELA are designed and produced in Danmark - and has been since the founding og the company in 1935 .